Metro offering new tours of Union Station art and architecture in Spanish! City of Dreams/River of History by Richard Wyatt in collaboration with May Sun. Inspired by its popular Union Station art and architecture tours, Metro will launch the first in a series of free Spanish-language tours of the station beginning on Saturday, October 10. 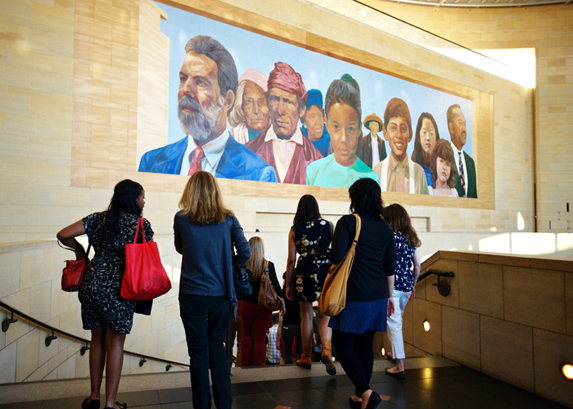 Led by trained Metro Art Docents and part of the Metro Art Moves series of tours, this new offering covers Union Station art, architecture and spaces not generally open to the public, including the Historic Ticketing Hall and former Fred Harvey restaurant. Additionally, the tour explores artworks located in the Gold Line portal and inside the Metro Headquarters Building. Meet promptly at 10:30 a.m. at the Union Station Information Kiosk, just inside the Alameda Street entrance. The tour has limited capacity and space is available on a first-come, first-served basis. Reservations are not required. Want to grab a snack before the tour or feeling a little hungry afterward? Show your TAP card and take advantage of special Metro Destination Discounts at Union Station. Tour begins at 10:30 a.m. at the Union Station Information Kiosk, inside the Alameda Street entrance. Tour ends at approximately 12:30 p.m.
Tour is approximately 90 percent walking; there are elevators and escalators at the station. Public restrooms are available at the station. Metro Art Moves tours highlight Metro’s diverse collection of artworks, heighten the passenger experience in fun and engaging ways to boost public perceptions about transit, promote rider etiquette and offer opportunities for discovery. Docent-guided tours of artworks in rail stations are offered the first Saturday and Sunday of every month. Union Station tours—in English—are offered on the second Sunday of every month. Tours for groups of fifteen or more are also available by special arrangement. For more information visit metro.net/art and click on Art Tours or call (213) 922-4ART. Stay tuned for announcements of future Spanish tours. See more photos of Union Station below.